I know that my students need help in assessing the validity of information that they find on the web. So I approached one of the English I teachers to see if she would like a lesson on how to discern the difference between fake and real news. Her students were starting Animal Farm by George Orwell. We thought this would be the perfect place to insert my lesson as propaganda plays a key role in the story as well as the Squealer's ability to adjust the facts to fit his own logic to get the animals to do his bidding. So I created a slide show that would direct students to various tasks using web tools that would allow them to look at websites and news feeds in a new way. I like to start a lesson with something to grab students attention. I have used giphs or memes, but for this lesson I found a fabulous video that you will find linked on the second slide. The author of Broadcast Hysteria, A. Brad Schwartz, put together a seven minute video about his book using excellent vintage photos and videos to evoke the feel of the 1938 War of the Worlds' broadcast. To find the web tools, I started with a Huffington Post story and then moved on to tools promoted by November Learning. Then I read about the Media Bias/Fact Check website. I don't remember how I found that one. Maybe it was on the New York Times. 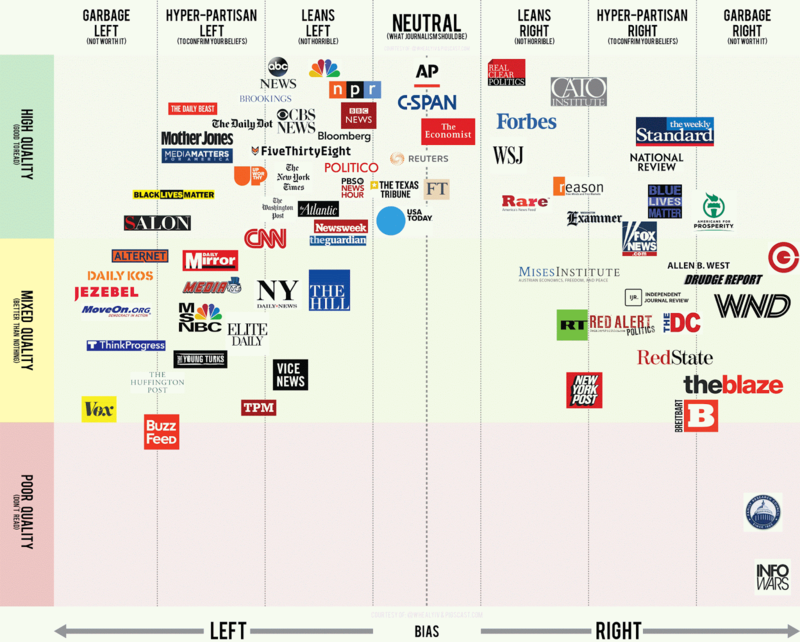 Finally, I found a great infographic where they had used the Media Bias//Fact Check website to fit different news media on a continuum from left to right. You can see that infographic pictured above. In some of the tasks that I give to my students, I use two of my own websites as examples. I ask them who has registered our school library website: pftstalibrary.com. It was me. Also, I ask them to find out who has linked to this blog talesfromaloudlibrarian.com, and if they think those links give the blog that I write credibility in school library world. Below is my slide show. Please feel free to copy it and make it your own to use at your school. You may want to edit the links for my library to something that you own. I have also included Padlets at the end of the slide show for the students to reflect on what they learned and what else they might like to know. Those Padlets are now closed, but you may read them or you may want to create your own for your students.The lesson in its entirety took about 75 minutes. On the slides where the students had to open links and read articles, I gave them plenty of time to read. Also, we were having some Internet issues, and so you will find screenshots embedded in the slides just in case the students could not open the links. I wanted this to be a hands on activity, but we cannot always count on the Internet when we need it. I was thrilled with how this lesson turned out, and I had my principal observe me during one of the presentations for my official spring observation. Open here for a link to the Google Slide Show. You may make a copy and edit to fit your needs. WOW!!! Wonderful. I hope you don't mind if I use some of the slides to work with my 7th graders? Please use whatever will work for you. I put the lesson here to share. Is there a link to download the presentation?